After all this time, I’m now convinced that I live in the future. We can actually talk to our phones. We can now get from place to place in the laziest and dumbest way possible. Now, we have desktop computing that fits in our pocket! 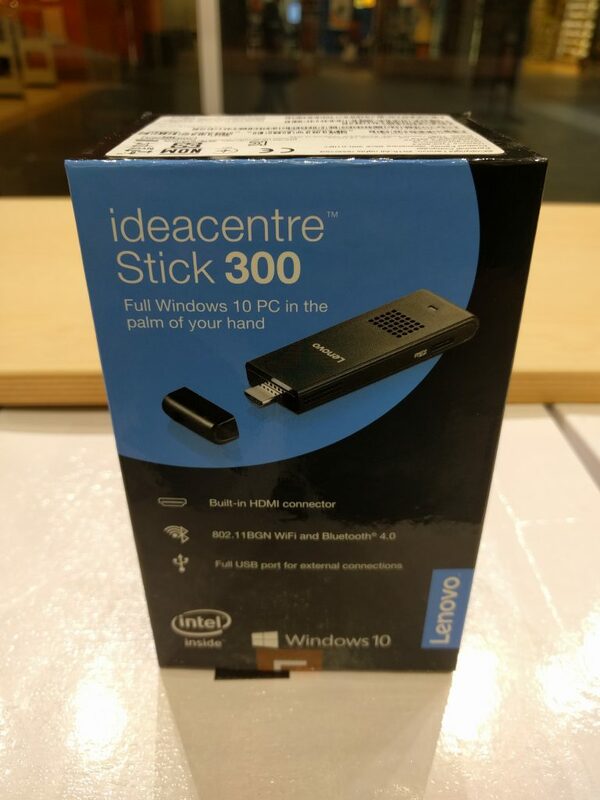 Of course, I’m talking about the Lenovo IdeaCentre Stick 300. I like to call it my Lenovo Compute Stick. I call it that because its based off a device that Intel had been working on for a while and now sell. After looking at the two devices, it seems almost as if Lenovo just slapped their logo on it and said it was theirs. One of the things I do like about the device is that it is small. Its nice to be able to have a fully capable desktop PC in a living room without having to try and hide a box and cables. With that small form factor comes a full Windows 10 experience. From first boot all the way to the first time you see the desktop, you’ll be familiar with everything you see. The device is powered through a microUSB port and has a full sized USB Type A port to allow the use of peripherals such as keyboard and mice (which you will obviously need). There is also a microSD slot built-in so you can expand the storage. So, I originally bought this device so I can stream Xbox One games to my office TV so I can game in more places without having to buy more consoles or even a ridiculously powered PC. Let’s say I was severely disappointed at what I found after plugging it in. First off, the wireless onboard the device just falls short. I was able to get the Xbox One streaming to work, but frames dropped liked they were hot on that thing. It makes games unplayable unless you are playing something slow and methodical and can afford to miss some frames. Now, I know you will say that 1080p at 60FPS would be hard a on a little device and, normally, I’d agree with you if the device was trying to do that natively. This device had issues trying to stream Netflix, Hulu, and WatchESPN which a Chromecast, Roku, or FireTV Stick can do without question. Now, I could essentially add a stronger WiFi dongle to the system or even plug in into an ethernet port, but to do that, I would need to buy a USB hub because, while the device has a USB port, it only has “a” USB port. And speaking of USB, even though it runs off of microUSB, I still have to plug it into the wall. According to Gizmodo, they were able to at least get the Intel reference device to power straight from the TV. If I’m forced to plug this thing into the wall, I should be able to get a little more performance or at least be able to power a USB external hard drive, but, alas, I wasn’t. To be honest, if you’re looking for something to make a your TV just a little smarter, I’d look elsewhere. There are many other set top devices that will better meet your needs, some of which that can be hidden from view. The only way I can recommend it is if you would like to check email and surf the web and you prefer to use a desktop computer instead of a phone or tablet. Too bad really, I was also looking into these to stream xbox and steam games. I read other reviews and they all had the same cons that you found. Yeah, it was really disappointing. I went home later that night and tried external WiFi adapters. Still doesn’t work like I want it to. It also doesn’t seem worth trying to purchase an ethernet adapter for it as it would defeat the purpose.